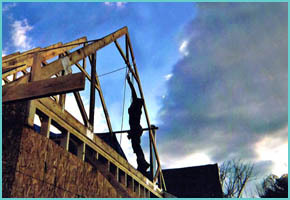 For more than 30 years Ferrizzi Construction, Inc. has been providing top notch service in all phases of construction. We work with our customers to ensure satisfaction with no hidden costs. We build custom homes, additions & garages from the modest to the lavish. We have removed interior walls to compliment open concept living spaces, added stacked second story additions to existing homes, as well as, custom remodeled kitchens & baths. We build basic or elaborate deck designs offering composites, mufti-tiers, custom railings, hot tub & swimming pool compliments. We have transformed basements into apartments, family rooms, home gyms, home theaters, play rooms, wine cellars, & even an art gallery! We have worked with the Veterans Association. We utilize"Specially Adaptive Housing" protocol. This ensures our vets in need of accessible home conversions will receive 'the best'. At Ferrizzi Contruction Inc., we strive to offer our customers cost effective solutions to their construction needs large or small. We engineer quality, value & a solid work ethic into every job.